In 1929 when the Sammy and Sausage series was complete, I rejoined Griffiths who was then working on 60 foot advertising cartoon films for Moss Empires. We formed a partnership, Griffiths and White, working from a third floor office at Charing Cross House, 29a Charing Cross Road, producing animated advertisements for Superads. Among the tenants of the building was Vivian Van Damm who was promoting Syntoc – a sound and disc system for cartoon films; this was before he started the Windmill Theatre. Grif and I investigated this system but Sound on Film was developed and improved and was better for our purposes. In another office was a boxing promoter. The various floors were serviced by a rather small old-fashioned lift encircled by stone steps that wound up to the top of the building. One day the promoter was visited by Primo Carnera, a very tall man and heavyweight boxer, who was to become World Champion. The lift boy was so scared, why I do not know, that he vanished so as not to go up in the lift with him. Carnera had to walk up. This old building was subsequently pulled down and an Odeon theatre built in its place. We made a cartoon film here of Austin B. Paynes’ characters Pip Squeak & Wilfred. We also did a film for Jack Hylton – Tiptoe through the Tulips. I remember we worked all night to finish it. It was shown at the Palladium on a semi-transparent screen with Jack Hylton playing in the background. For one of our advertising cartoon films – it was for Pratts Petrol (later to become Esso) we rather wanted to show a petrol pump in colour. This was before the days of colour photography it should be remembered, The petrol pump in question was orange with a white: globe on top. What we did was to have a white pump on a black background in close up. We then brushed vaseline on the globe on each frame. After immersing the film section (it was about 6 feet or just over) in an orange dye bath, we wiped off the vaseline and had quite a good shot of the orange pump with a white globe. This I believe was the first cartoon colour film to be made in England. 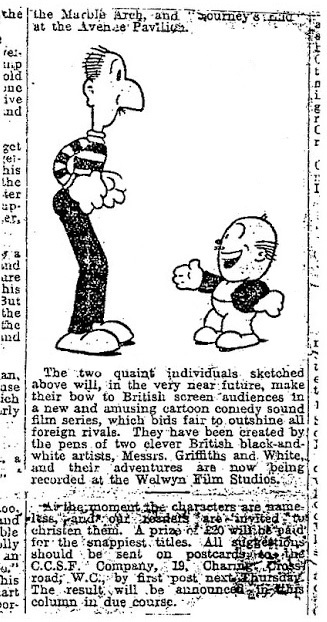 While we were still working as Griffiths & White on cartoon advertising films, we were scheduled to make two 1000 feet cartoons with sound for the Comedy Cartoon Sound Films Ltd. company which was formed in May 1930. We never had more help than a teaboy and worked even then on a shoestring budget. Hite and Mite names chosen by public subscription in the News of the World, 1930. They were based on White and Griffiths respectively. Amongst the various lads we had was Giles who was to become famous as the Daily and Sunday Express cartoonist, then about 15 years old. Not wanting to follow the Walt Disney trend with animal characters we decided to use humans as principals. I suppose, as we were always caricaturing each other, we just had to be characters in cartoon form. We were rather stumped for names but the News of the World paper stepped in and ran a competition to name the two. We chose Hite and Mite and I being the tallest was Hite. One of the films was entitled Tropical Breezes which we produced in 1930. About the same time Joe Noble produced a ‘Mr York’ cartoon for Rowntrees. So between the three of us we produced the first synchronised talking cartoon films in the country. By the end of 1931 Bill (as I used to call Jessie; to her family and friends she was Jo) and I moved to Chasecroft, Grimsdyke Crescent, Barnet. Here our son John Dymock was born on 1 October. Can you expand on the relationship of White & Griffiths and Super-Ads, both being located in Charing Cross House? Was Super-Ads an agency, or an animation house? According to Laurie Price, in his letters to Carl Giles in 1955 recalling those days (1929-31), he and teaboy Giles, along with White & Griffiths, John Alderson, Matheson, Millett, Dudley Buxton and Jorgen Myller were employed by Super-Ads.